A suffering economy brings about societal changes that often end up turning into conventions. Luckily, when situations out of our control force change, sometimes it is actually beneficial. Sometimes, we are forced to think of better, more productive, cost-effective ways of doing everyday things: Such is the case in the horse feeder market. Rising production and labor costs–coupled with a crippled economical climate–have forced farmers to say goodbye to conventional square bales, implementing the economical round hay bales for horse feeding. Thanks to this unexpected augmentation in hay bale production, an innovative, resourceful horse feeding method has been launched in the form of the Hayhut round bale feeder. With the help of the Hayhut, bad weather and messy horses are no longer variables that affect your hay supply or quality. Hayhuts save hay, and in turn, they save time, money and labor. They protect and preserve hay, keeping it dry, fresh and in place whether it's rainy, windy or snowy. Even on a hot, sunny day, your hay stays cool, and your horses happily protect their eyes and shade their heads and necks while they dine. Your horses will not only be happy with a Hayhut round bale feeder, they'll be safe: Metal square feeders and hardware round bale feeders have sharp, metal edges and tubes that rust and break, which can injure your animals (or you). Weather just exacerbates the rusting process; however, with the Hayhut, harsh weather is never a problem! 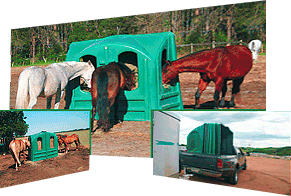 The Hayhut is a durable, UV stabilized, covered round hay feeder made of polyethylene, so it cannot rust or break down. It also won't require any upkeep or maintenance like common metal feeders, saving you even more money. Saving money is important to everyone these days, and whether you are an equestrian, a farmer, or just a horse owner, your animal's health and happiness is important to you too. Horses are known to disregard or disrespect hay that is soiled by the elements. Rather than being eaten, spoiled hay ends up going to waste by being defecated on, slept in, scuffed away into the wind, or stomped into the ground. You'll prefer the money-saving ingenuity of the Hayhut, and your horses will prefer the comfort and fresh food that Hayhuts provide. It's worth noting that Hayhuts are not just for round bales. Conventional square bales can be stacked in Hayhuts where the same hay-saving preservation process ensues: hay is saved, horses are happy, your property is clean, and you have a few extra bucks in your pocket! Metal feeders are a thing of the past. They belong in the club of ancient, almost medieval farming equipment that more closely resemble torture devices, rather than staple farm accessories. It's about time the horse feeder market was modernized, and now you can enjoy all the perks of this ingenious round hay feeder for your horses.